The announcement late Sunday of the death of al-Qaeda leader Osama bin Laden has set the Internet abuzz, as users searched for information and shared their thoughts on the killing of one of the world’s most wanted men. In a late-night appearance at the White House, U.S. President Barack Obama said that bin Laden had been killed in a U.S. operation in Pakistan on Sunday. An IT consultant in Abottabad, the town where bin Laden was killed, inadvertently “live blogged” an early sign of the military operation on Twitter, without realizing its importance until much later. He now has over 14,000 followers on the micro-blogging site. He moved to Abottabad from Lahore for some “peace and quiet,” he said. The events will provide an opportunity for malicious websites to infect computers by tricking users into visiting their sites for more information, warned security experts. Cybercrooks can trick the search-ranking algorithms of popular search engines by feeding them fake pages to make their sites seem legitimate, increasing the chances that Internet users searching for news land on a site dispensing malware, warned Paul Ducklin, head of technology at IT security firm Sophos, in a post on the company’s web site. Fabio Assolini, an expert at IT security company Kaspersky Lab, already had examples of malware-laced pages cropping up in response to a Google image search for “osama bin laden body.” Users clicking on some of the images in the results are redirected to one of two malicious domains offering a copy of the rogueware known as “Best Antivirus 2011”, Assolini said in a blog posting. Twitter reported that its site carried more than 4,000 messages per second at the beginning and end of Obama’s speech. The death of bin Laden, Abottabad, and Navy Seal, the special operations force that killed bin Laden, were among the top topics being discussed on Twitter a couple of hours after Obama’s announcement. 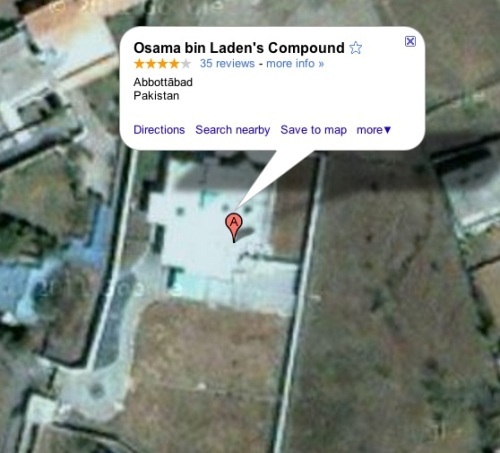 Google Trends also reported that “osama bin laden dead” was the hottest search on May 1 in the U.S., followed by some other search items that are related to the death of bin Laden. On Facebook, a page “Osama Bin Laden is DEAD” had 258,400 people who “liked” the page, many of whom commented on bin Laden’s death. The page appears to have been set up before the death of bin Laden was announced, and subscribes to the theory that bin Laden was already dead a long time ago.